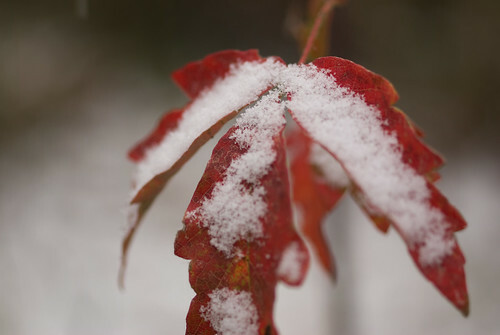 It’s been very wintry around here the last few days, with snow and temperatures rapidly heading downward from freezing. 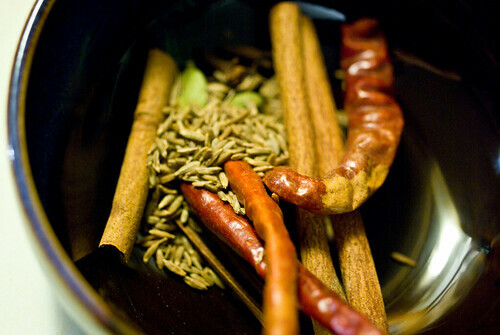 We’ve been doing a lot of cooking with spices, ginger and chiles to take the edge off, like the udon and shrimp in Thai-spiced broth we had last night, or the Parsi goat curry the night before. 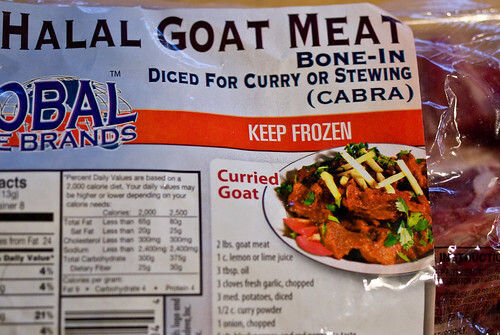 We were so excited when we found frozen halal goat meat at a small Indian grocery in Everett. We’ve thought about sourcing goat locally, but haven’t actually cooked with it before, so this seemed like a good opportunity to try it. When we thawed it out and took a look, though, it appeared that someone with a bandsaw had randomly passed a whole goat through the blade and tossed the chunks in a bag – I couldn’t tell what parts we had to work with, and there were odd pieces of bone everywhere. Oh, well, we were going to be braising it anyway. The recipe I decided to try was a special occasion meat-and-potatoes dish from My Bombay Kitchen called kid papeta ma gos. First we rubbed the meat with a paste of garlic, ginger and salt. 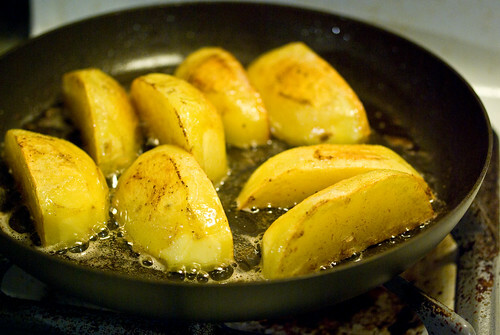 Then I quartered a couple of potatoes and fried them in butter. 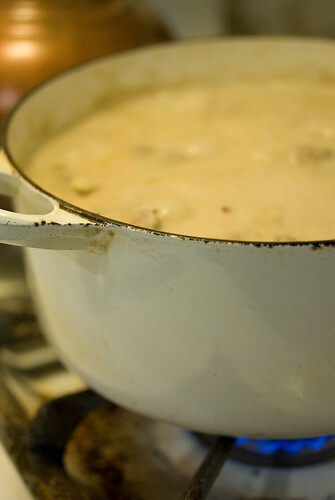 I sauteed onions in a Dutch oven, added whole cinnamon, cloves, cumin seed, cardamom pods and dried red chile, then added the meat and covered it with a mixture of water and coconut milk. I covered it and let it braise about an hour, adding the potatoes halfway through. The result was mixed. The goat obviously needed more time to tenderize, as there was a ton of connective tissue and it was very tough. The sauce was rather bland, and very starchy from the potatoes – the spices were hard to taste. I’m not sure I’d make this one again, even allowing extra time for the braise. I’m still intrigued by goat meat, however, so we’ll probably have another go at that at some point. Anyone have any tips for goat cookery? I have a tip for goat cookery. 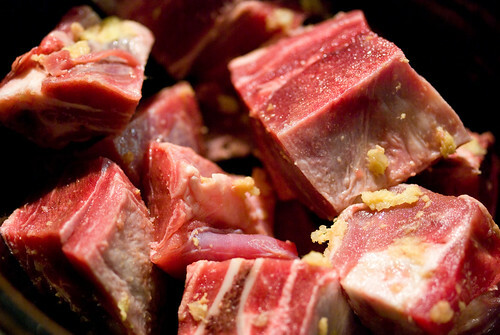 Get goat meat that has been butchered in a logical way. Cubes of goat where there’s one tiny scrap of meat amongst a mess of bone, fat and connective tissue is stupid. I bought that same brand of goat at the Skagit co-op in the frezer section. Yes the cut is strange but my husband is lazy in regards to working to get to food and he deemed it worth the work. 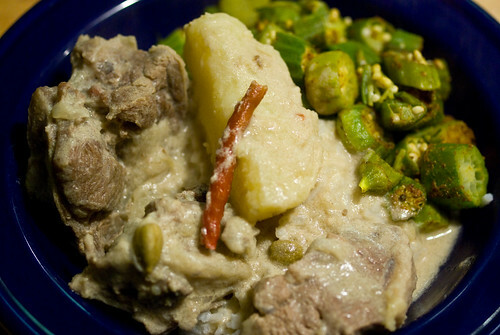 I made goat curry from Chow.com that sounds pretty close to your dish. I was going out for the day so I cooked it in a crock pot and it worked out well. I serve a curry like this with garnishes like garlic chutney, chopped tomatoes, cashews, boiled egg, rasins, and toasted coconut. The goat was tender and the flavor was lovely. Sound like yours would have handled a bit more time cooking. I did crock at low for 6-8 hours. Cooking time was definitely a big part of the issue. We don’t have a crock pot so we need to fit long braises into days when we’re going to be home, which sometimes backfires. Glad to hear you had better luck! And I’ve never seen goat at the co-op, but I often forget to look in the freezer case – I’ll have to check it out, thanks!